These pictures were taken last January as we travel from Florida to Mississippi for our Christmas Vacation in my in-laws. We decided to travel on the beach side of Florida. We are not in a hurry so, we took this route. It took us 12 hours to reach Mississippi but, its worth it. We stop few times to dine in the restaurants. These pictures were taken as we travel at 40mph, so some pictures are not as good as it should be. My husband was driving and I am taking pictures. 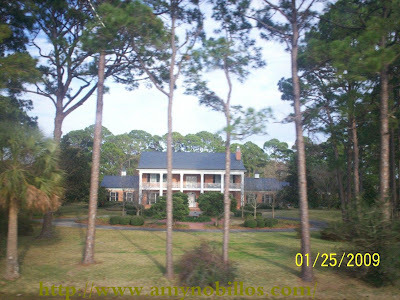 As you can see the above picture, the huge tree covers the house. 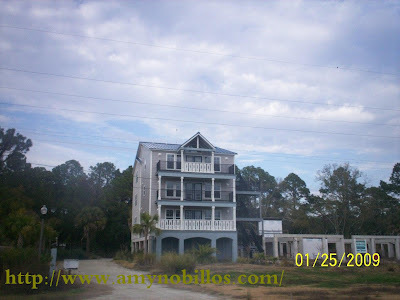 These are beach houses and most of them are vacation houses, rented during summer and holidays. Notice the high posts? These houses are facing the beach. 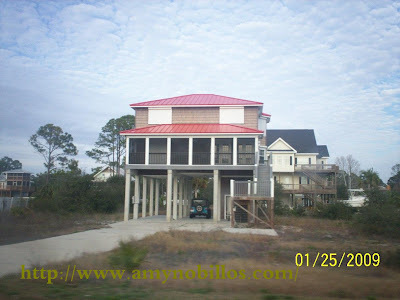 If there are big hurricanes, most of these houses are wiped out but, rebuilt again. I like this house because it has manicured lawn, huge and the beach is at the front. I like to live here for vacation but not for longer days. This area is like a ghost town. See the lower buildings? It was damaged by Hurricane Katrina. The place is really enchanting but, hurricane season is the problem. This place will never progress because of the location. Do you like to live this house? I wonder what the team of TAPS and Ghost Hunter will say...hehehe. Honestly, I love the beauty of this place. All of this houses were at the right side of the road and the front view is already the beach. 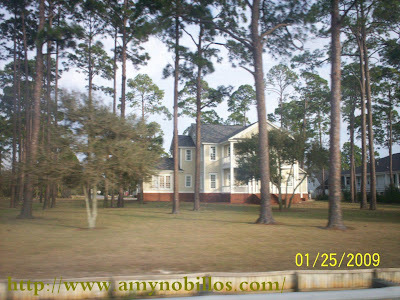 saka pansin ko din sis when we went to pensacola that houses there were painter with brightly colored paints.. 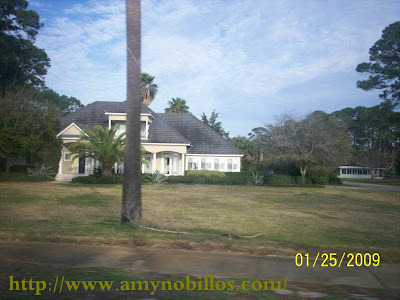 Ask ko pala opinion mo about my latest post on paid blogging - "On paying Off Debts"
i like the style of houses here, is it scary or eerie to stay in these houses, too? wow! i like the houses. how are you amy? oh my gosh...these are luxurious....kanus-a pa kaha ko ani kapalit...ehhehe..ayha ra siguro kung tag 500 na ang opps sa SS...nyahahhaha! bitaw agi ko dire teAmz, salamat sa dalaw at comment ha...mwah! ang gaganda ng houses...ganda pa ng location malapit sa beach. ganda naman ng mga houses dito dear :-); i like the 3rd one for some reason :-).